Easy Cordon Bleu at Home! Chicken Cordon Bleu is a great way to make a fancy restaurant meal right at home! Don’t let the name fool you, like most baked chicken recipes, it is actually easy to prepare! Tender chicken breasts are stuffed with smoky ham and swiss cheese. These easy rolls are breaded and baked until golden and juicy. 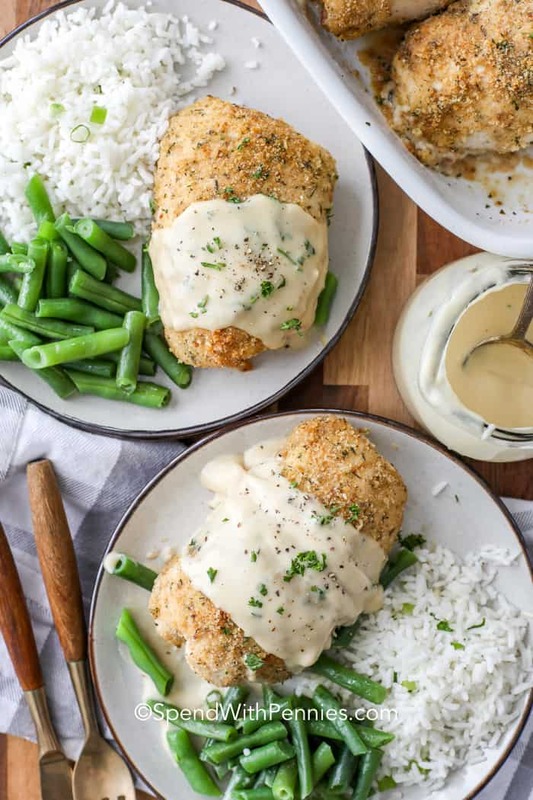 A simple dijon cream sauce is the perfect compliment. Serve this delicious dish with Oven Roasted Asparagus or Parmesan Roasted Broccoli! “Cordon Bleu” translates to blue ribbon and I can assure you this easy chicken cordon bleu recipe is worthy of a blue ribbon! A traditional cordon bleu has tender chicken wrapped around ham and swiss cheese but you can mix and match the parts to this recipe and be creative! CHEESE: Swap out the Swiss for provolone or even cheddar cheese! 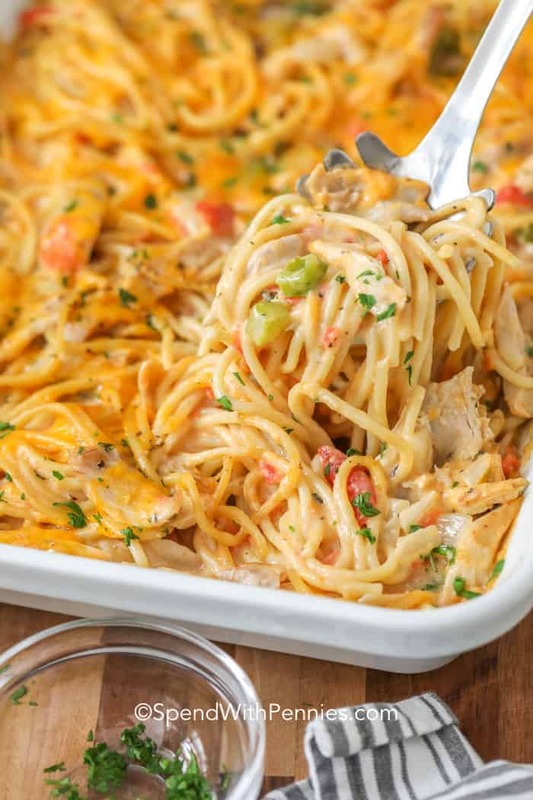 Cheese slices provide a thicker cheese layer, shredded cheeses can melt into the chicken. BREADCRUMBS: This recipe uses seasoned breadcrumbs. You can substitute Panko or make your own seasoned crumbs by adding 1/4 teaspoon each garlic powder, onion powder and salt. Stir in 1/2 teaspoon parsley and a pinch of oregano. We make a simple homemade dijon sauce to serve with this recipe. If you’d prefer, you can serve this with an easy cheese sauce (swap out the cheddar for parm and swiss). If you’re short on time you can used a packaged hollandaise sauce or skip the sauce altogether. Still nervous? Don’t be! 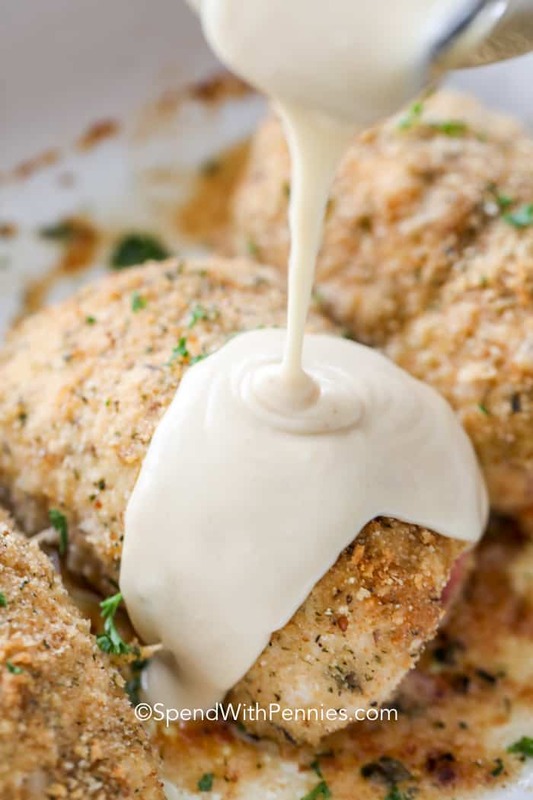 We mean it when we say this chicken cordon bleu recipe isn’t difficult to make! To make this recipe, you’ll want to start by preparing the chicken. To Prepare Chicken for Stuffing: Place the chicken between 2 sheets of plastic wrap (this keeps it from splattering juices everywhere). Simply pound the chicken with the flat side of a meat mallet or tenderizer until it is 1/4″ thick. If the chicken breast is really thick you can butterfly it open before pounding. You’ll want to be firm but gentle when pounding so the chicken thins out but doesn’t get damaged or fall apart. Fold in the sides of the chicken and roll up jelly roll style. 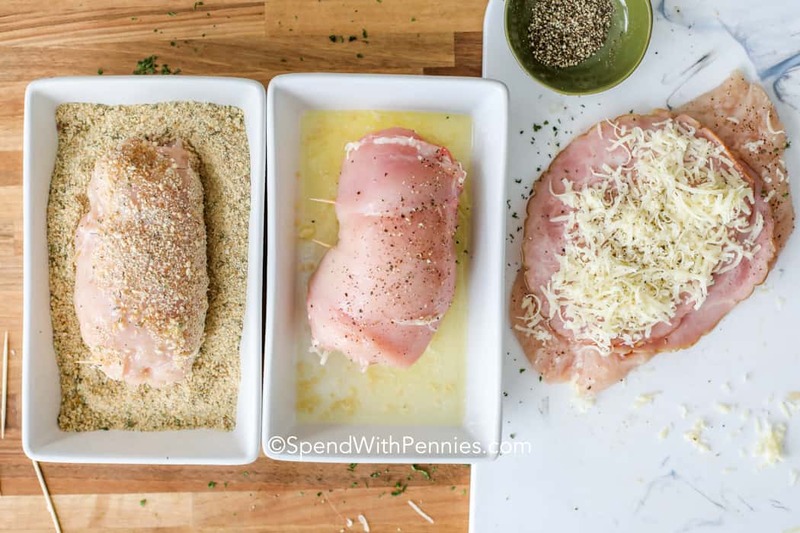 This easy chicken cordon bleu does take a few steps but none of them are hard! Here’s a good tip: soak the toothpicks in water before securing the chicken so they don’t burn in the oven and will slide easily out of the finished chicken roll. I always put 2 toothpicks per roll so I can account for all of them when I am serving. Prep your chicken and start layering with your ham and cheese. Roll in your melted butter with garlic then your seasoned breadcrumbs and bake! While that’s baking prep your sauce and pour over your final dish! See! This fancy restaurant meal really is that easy but don’t worry your secret is safe with us! What to Serve With Chicken Cordon Bleu? Cordon bleu is a rich meal with bold flavors so a light and fresh side makes the perfect compliment. I would suggest a steamed or roasted vegetable like Steamed Broccoli. Add in a tossed or Caesar Salad and a side of garlic butter rice for the perfect meal! 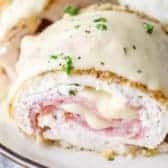 This baked chicken cordon bleu recipe can feed as few as four or double the recipe and have a fancy dinner party for 8! Leftovers can be made into a delicious sandwich can be made on a crusty baguette with some spicy mustard and a few leaves of crispy lettuce! Hearty and flavorful! Spinach Stuffed Chicken Breast – Delicious bacon wrapped stuffed chicken breasts! Pepperoni & Cheese Stuffed Chicken Breasts – A pizza lovers’ dream! Bacon Wrapped Chicken – Cheese stuffed, bacon wrapped… need we say more? Mushroom Stuffed Chicken Breast – Stuffed with a delicious mushroom cream filling. 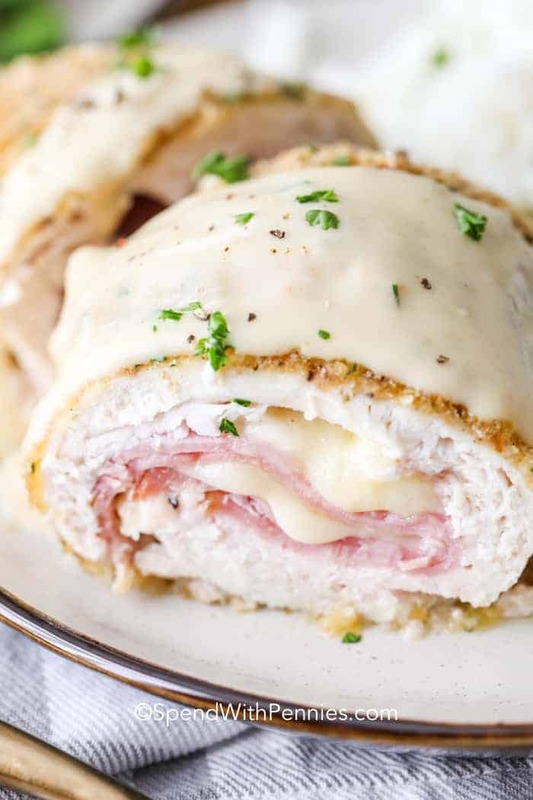 This Chicken cordon bleu is a fancy restaurant meal made easy! Pound chicken to 1/4” thick. Season with salt and pepper to taste. Top each chicken breast with 1 slice of ham and about 1 oz cheese. Roll the chicken jelly roll style. Secure with a toothpick. Combine garlic and butter in a small dish. Mix breadcrumbs and thyme in a separate bowl. Dip each chicken roll in butter and then into the breadcrumb mixture. 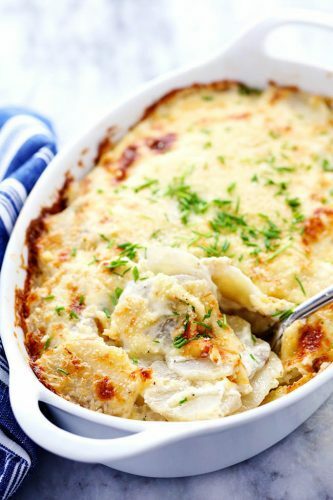 Place in a baking dish and bake 35-40 minutes or until chicken reaches 165°F. Melt butter in a small sauce pan. Add flour and cook 1 minute. Add in wine and milk a little bit at a time stirring after each addition until the mixture is smooth. Add in Dijon, bouillon and Worcestershire. Bring to a boil while whisking and reduce heat. Simmer 1 minute. Remove from heat and stir in parmesan cheese. Season with salt and pepper to taste. Serve over chicken. Cordon Bleu Casserole – No cream of anything soup in this! Grilled Chicken Cordon Bleu – Summertime favorite! 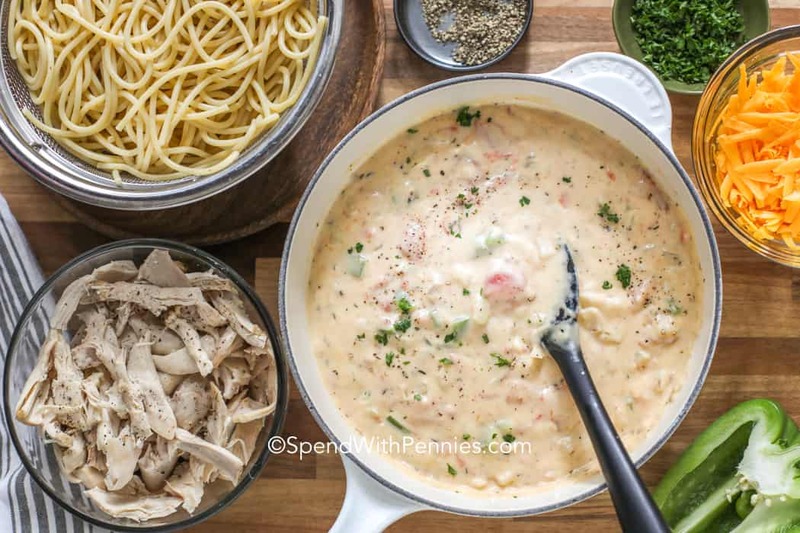 Chicken Cordon Bleu Soup – Easy, dreamy, creamy! 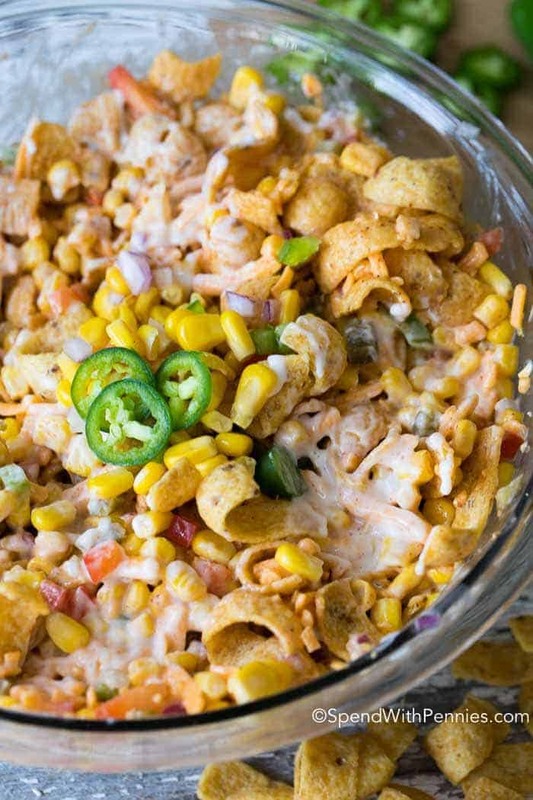 Frito Corn Salad is the perfect potluck dish! This easy salad combines sweet juicy corn, fresh bell peppers, spicy jalapenos and of course crunchy Fritos all in a creamy dressing. 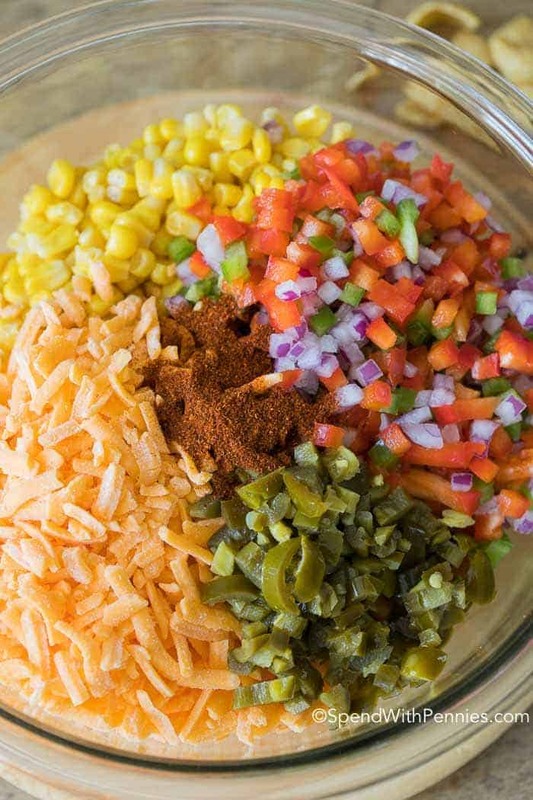 This is the perfect side dish or appetizer dip loaded with veggies and corn! If you’ve never had Frito Corn Salad before, you’ve been missing out my friend. 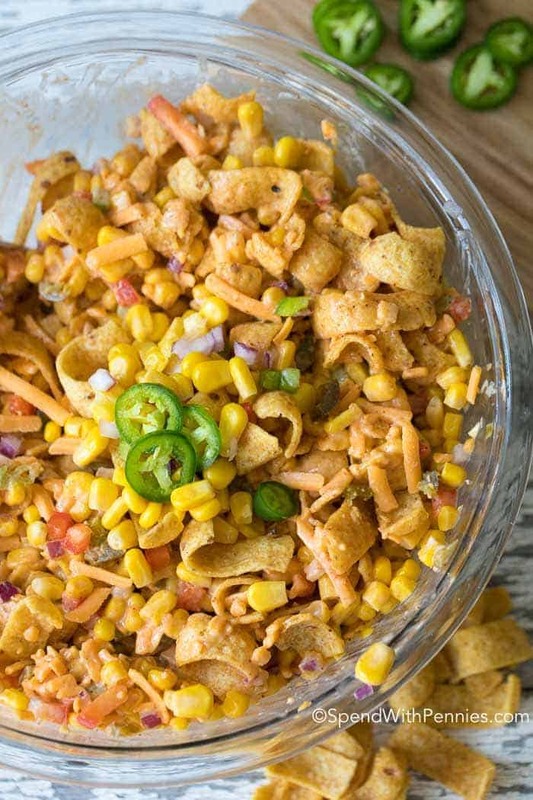 It’s pretty much the BEST ever way to enjoy Fritos (like they weren’t amazing enough already)! 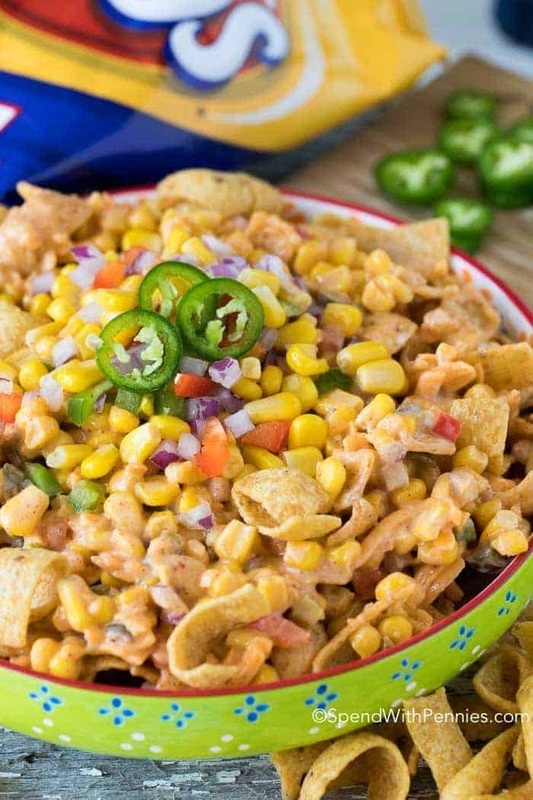 Delicious sweet corn, fresh crisp peppers and of course crispy crunchy Fritos all tossed in a quick creamy dressing. What more could you ask for? 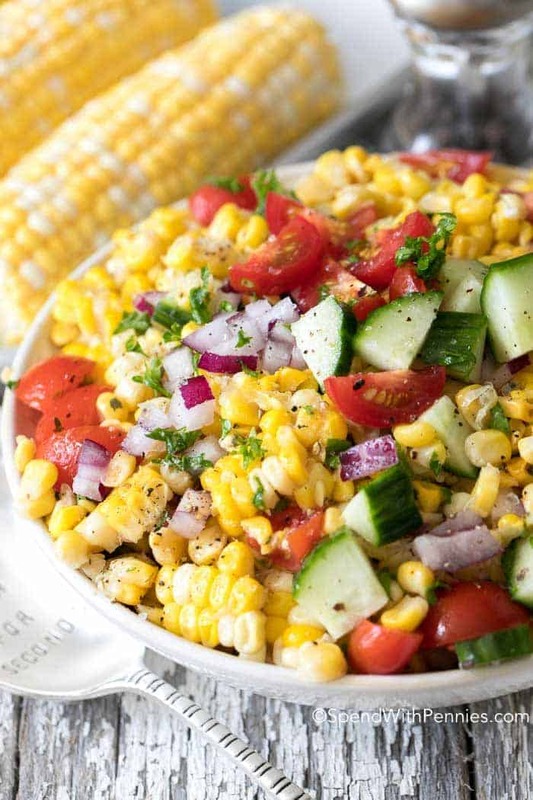 Fresh summer corn is so incredibly delish whether it is added to a fresh summer corn salad or even a Mexican Corn Dip. It just has a perfectly sweet crunch and a fresh flavor that somehow just tastes better on the deck next to a freshly grilled burger or hot dog! 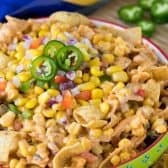 This Frito Corn Salad is most definitely the perfect side dish at a barbecue or a potluck but it also makes an awesome appetizer because people just love the flavors and the texture is perfect for dipping. One great thing is that it can all be made ahead of time making it the perfect potluck dish! I simply stir everything together keeping the Fritos on the side. At serving time, I give the Fritos bag a quick squish, sprinkle them on top and stir for a crunch that nobody can resist! 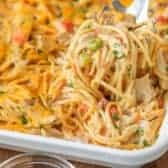 I use plain Fritos and add some chili powder to my dressing, if you happen to have Chili Cheese Fritos on hand, you can just add them in and skip the chili powder in the recipe! If you’d prefer, you can also make this Frito Corn Salad with ranch dressing and skip the mayonnaise completely. Prefer a zestier option? As strange as it sounds, you can also try catalina dressing (which is what I add to my famous Dorito Taco Salad) with excellent results! While some recipes make Frito corn salad with cream cheese, I personally find it a little bit too rich and prefer the other options! This recipe calls for canned or fresh corn. Both are great but of course, like most recipes, fresh is best (leftover or grilled corn is perfect too). I always cook corn in the Crock Pot and somehow I figure I have 192038 extra people coming… so I always have leftovers. This is the perfect way to enjoy all of my leftovers and everyone raves about it. I’m kind of a jalapeno freak (pretty much with any dish, the spicier the better) but if you’d like to tame this down a little, skip the jalapenos and add in some mild green chiles for flavor without the heat. I love the addition of fresh bell peppers for the crunch they add. You can also add a can of rinsed black beans. You can use either the Frito scoop chips or tortilla chips (or celery) to scoop this up if you’re serving it as a dip or just serve it with a fork as a side dish! If you happen to take this along to a potluck, print a few copies of the recipe to bring with you. I pretty much guarantee people will ask for it! The Best Potato Salad Recipe – Classic side, easy to make ahead! Ranch 7 Layer Salad – Great as a side or a main dish. Creamy Carrot Salad – Retro recipe, just like grandma used to make! Grape Salad – Creamy, fresh and delicious. Kids love this one! 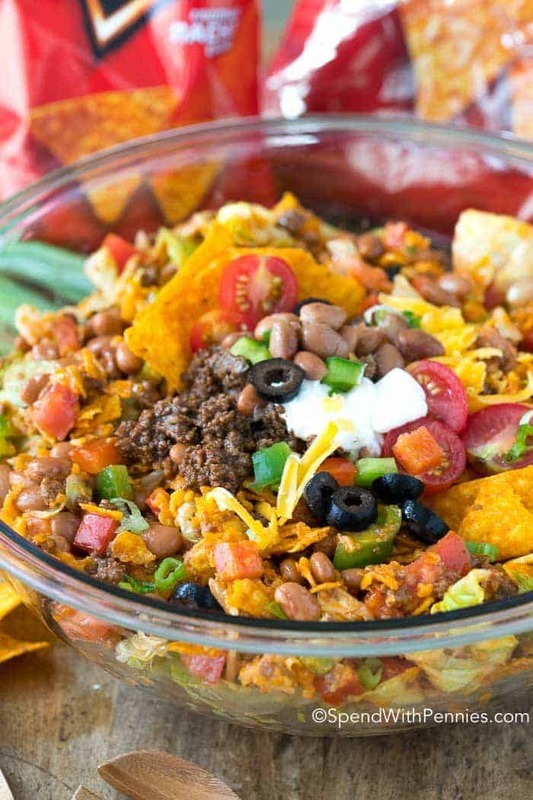 Dorito Taco Salad – Popular (reader favorite). 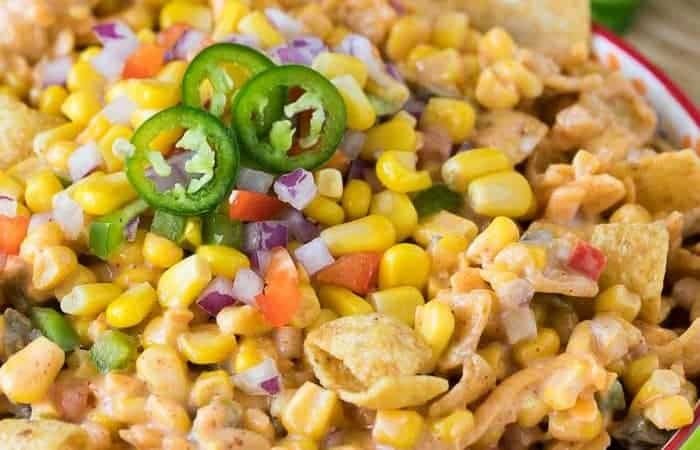 Frito Corn Salad combines sweet juicy corn, fresh bell peppers, spicy jalapenos and of course crunchy Fritos all in a creamy dressing. This is the perfect potluck side dish or appetizer dip! 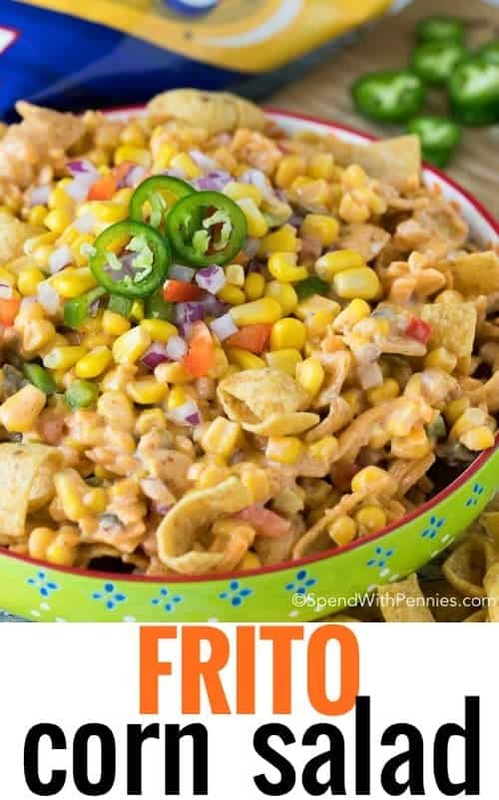 Combine all ingredients except Fritos in a large bowl and mix well. Just before serving, stir in Fritos. 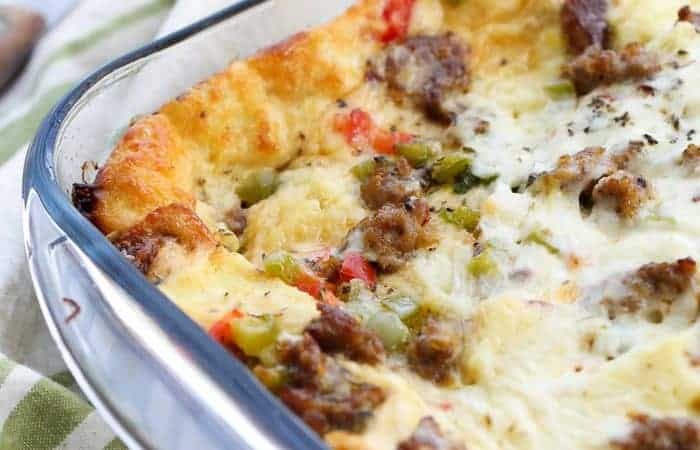 Sausage Breakfast Casserole is loaded with sausage, peppers, cheese and Italian seasoning is one my favorite make ahead breakfasts! The best part is this recipe is made ahead of time (overnight even) so it’s the perfect dish for a holiday morning or when you have guests! 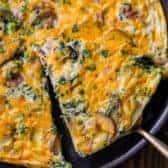 Serve this breakfast casserole recipe with a fresh fruit salad and mimosas for the perfect brunch! 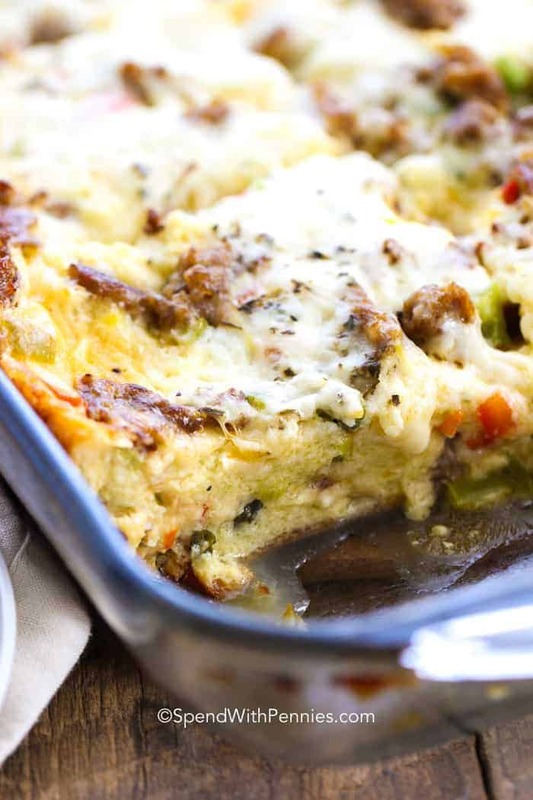 I love a good savory breakfast and this sausage breakfast casserole is definitely at the top of my list! My Mom has made bacon breakfast casserole on Christmas morning for as long as I can remember. It’s truly one of my absolute favorite things I eat at Christmas time. 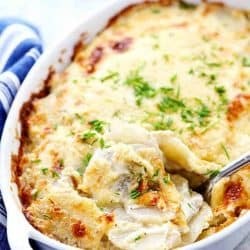 Over the years, I’ve enjoyed countless overnight casseroles (both in the oven and even an easy Slow Cooker Breakfast Casserole). I do have to admit, I think this sausage breakfast casserole might be my favorite yet, I just wish you could taste it through the screen. It’s so deliciously easy and savory. Loaded with sausage and cheese, this overnight casserole recipe is perfect for holidays, weekends and even for overnight guests. 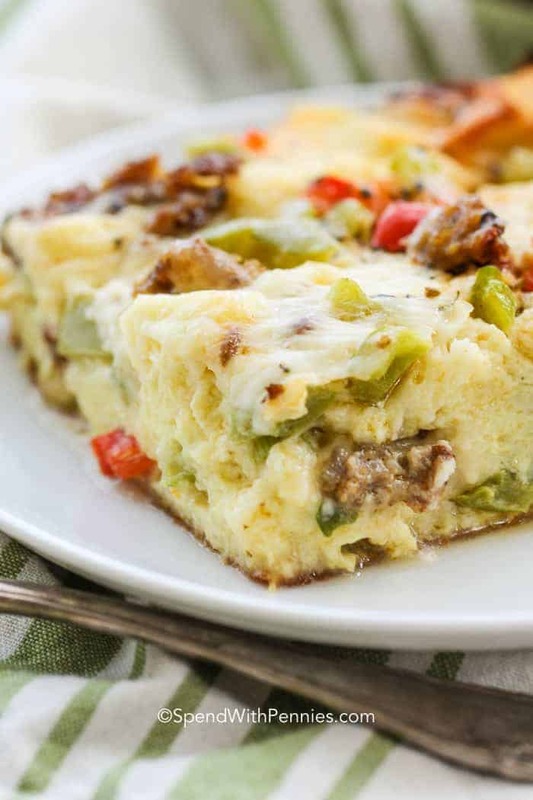 This overnight Sausage Breakfast Casserole is very simple to make! Bread cubes, chopped peppers and cooked sausage are placed in a casserole dish. The whole thing is topped with a simple egg mixture and of course cheese. Once prepared, this recipe goes into the refrigerator for at least 4 hours (overnight is best) to set. This allows the bread cubes to soak up the egg mixture. In the morning just bake and serve! I love adding Italian sausage to this recipe along with fresh red and green peppers because the sausage has so much flavor! 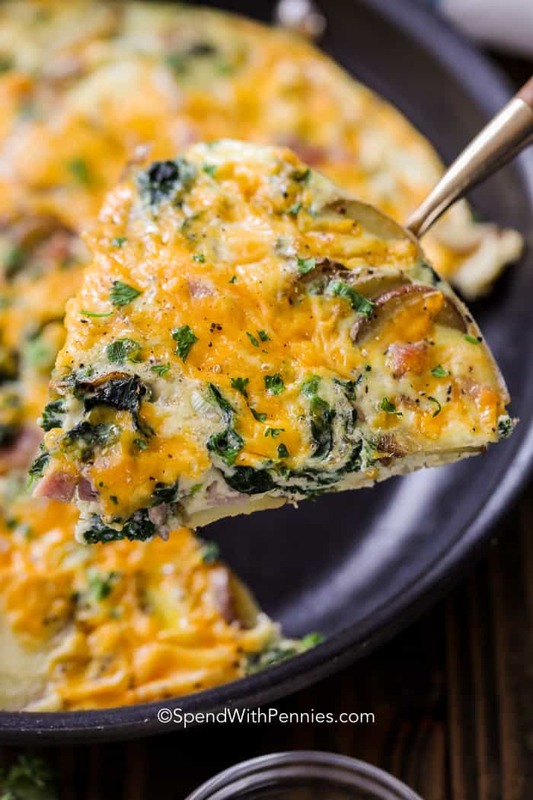 This quick and easy casserole recipe can be made the night before for a worry-free weekend breakfast (or prep in the morning to bake for dinner after a long day). This Sausage Breakfast Casserole is a full meal on it’s own but we do sometimes serve it with a Fruit Salad for breakfast (or a simple Cucumber Dill Tossed Salad for brunch or dinner). 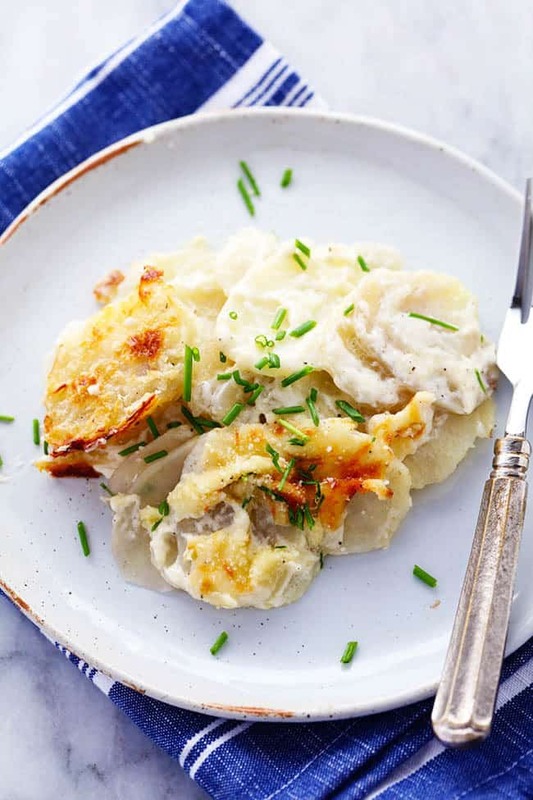 While I much prefer the consistency of this dish using bread cubes, you can certainly make this casserole without bread and replace it with hashbrowns. If you’re lucky enough to have leftovers, this dish reheats really well and freezes perfectly. BLT Avocado Egg Salad – Reader favorite!! 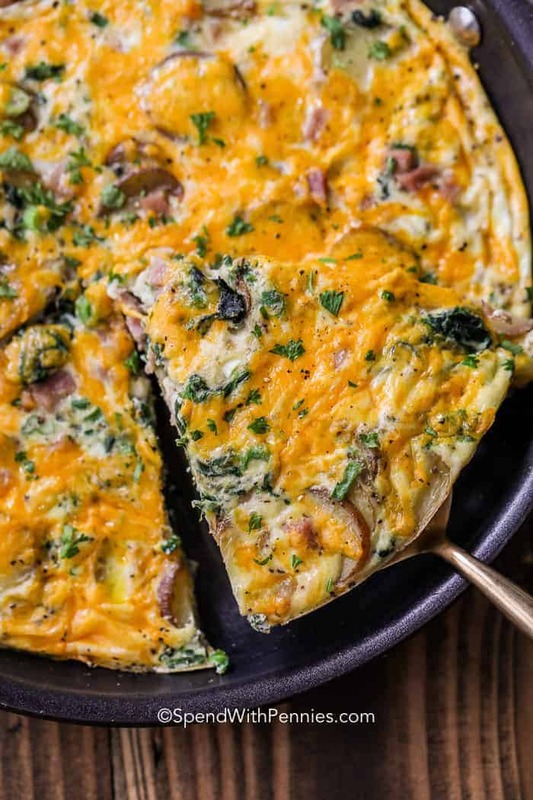 Easy Quiche Recipe – Easy Brunch recipe! Make Ahead Egg Muffins – Breakfast on the go! 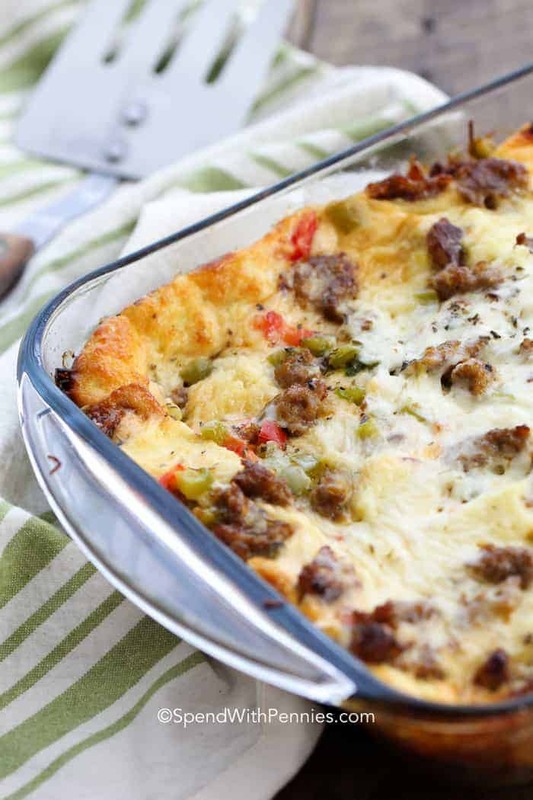 Overnight Sausage Breakfast Casserole with sausage, peppers, cheese and Italian seasoning is one my favorite make ahead breakfasts! Remove casing from sausage and cook over medium high heat until no pink remains. Drain any fat. Layer ½ of the cubes in a greased 9×13 pan. Top with ½ of each the sausage, green onions, peppers, and cheese. Repeat layers ending with cheese. Combine eggs, milk, & seasonings Pour egg mixture over bread ensuring all of the bread has been covered. Refrigerate overnight (or at least 3 hours). Remove from fridge and place in the oven while preheating the oven to 350 degrees. Bake covered with foil 65-75 minutes or until a knife inserted in the center comes out clean. (If you are baking 2 pans increase cooking time will need to increase). Allow bread to dry overnight or dry slightly in the oven oven at 300 degrees for about 10 minutes to dry slightly. (Do not brown or toast it). 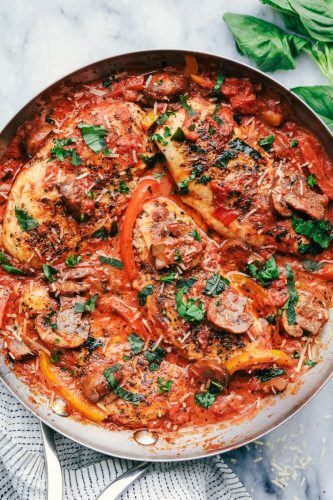 Creamy Skillet Chicken Cacciatore has the most amazing creamy red sauce with peppers, mushrooms, and fresh basil. The chicken is tender and juicy and on the dinner table in 30 minutes! Warm your home with this flavorful dish that brings out all the feel goods. The wonderful smell will draw everyone to the kitchen within minutes. Unstuffed Pepper Skillet, Italian Orzo and Sausage Skillet or Cajun Shrimp and Sausage Vegetable Skillet are a few one skillet meals for you to enjoy! I realized that it is getting pretty close to the babies arrival so we have been going full force trying to get everything ready to go. We have been finishing our basement which has been quite the project. We are only about 3 weeks away from having it completed and I can’t wait to have a fun space for the family once baby arrives. Right now we have both of our girls bedrooms next to each other but one of the rooms is used as a playroom. All of this will move to a playroom that we made in the basement and we will be able to put the babies room together. We are cutting it really close but that seems how life is! I ordered the babies furniture finally and I am starting to envision this sweet little girl that will be coming to our home. It is starting to feel more real! We have been so busy with our basement and life in general that I love when I can make a delicious and easy recipe for the family. 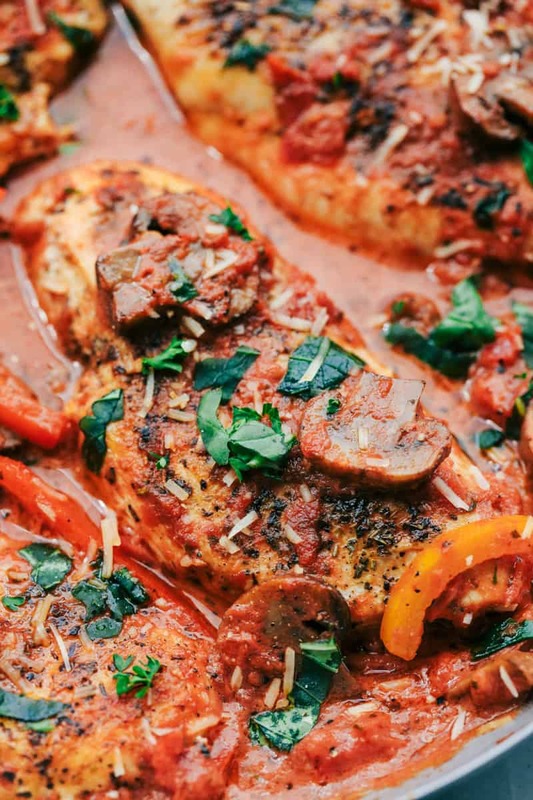 Chicken Cacciatore is one of my favorites. It is such a classic recipe with its red sauce with mushrooms, basil, and served over hot pasta. I customized the sauce to our families taste… bring on the creaminess, and it was a huge success! 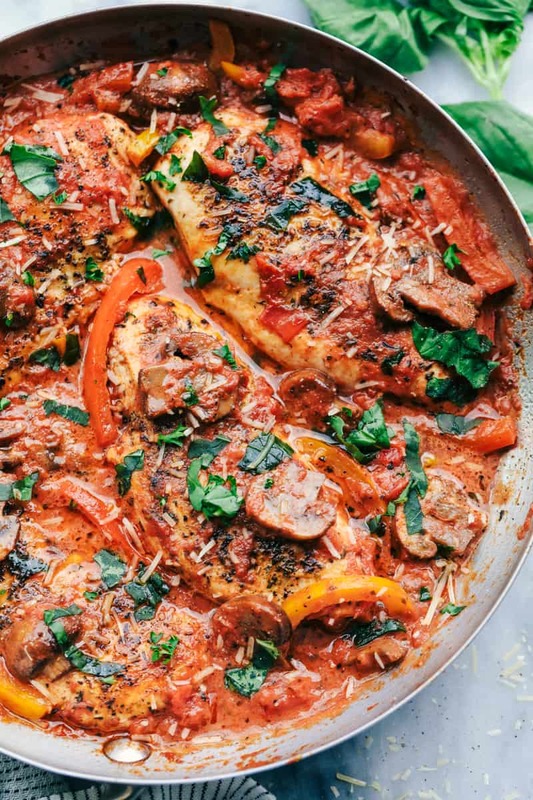 How Do You Make Creamy Skillet Chicken Cacciatore? Season the chicken with Italian seasoning and salt and pepper. In a large skillet add 1 tablespoon olive oil and heat to medium high. Cook the chicken about 3 minutes on each side or until a thermometer reads 165 degrees and brown on each side. Set aside the chicken on the plate. Add one tablespoon olive oil to the skillet and add the garlic, bell pepper, and mushrooms. Sauté until tender. Add the crushed tomatoes, heavy cream, chicken broth, Italian seasoning, and salt and pepper to taste. Let simmer until thickened. Add the chicken back to the skillet until heated through. Serve over hot pasta and garnish with fresh chopped basil and parmesan cheese if desired. Cacciatore means “hunter” in Italian. In cuisine, alla cacciatora refers to a meal prepared “hunter-style” with onions, herbs, usually tomatoes, often bell peppers, and sometimes wine. Cacciatore is popularly made with braised chicken or rabbit. You might be getting some quick and easy meals from here on out from the preggo Recipe Critic. But I still enjoy cooking for my family. But thats the thing! You don’t have to make it difficult to give your family a restaurant quality meal. And this meal is made in just one pot and on the dinner table in just 30 minutes! 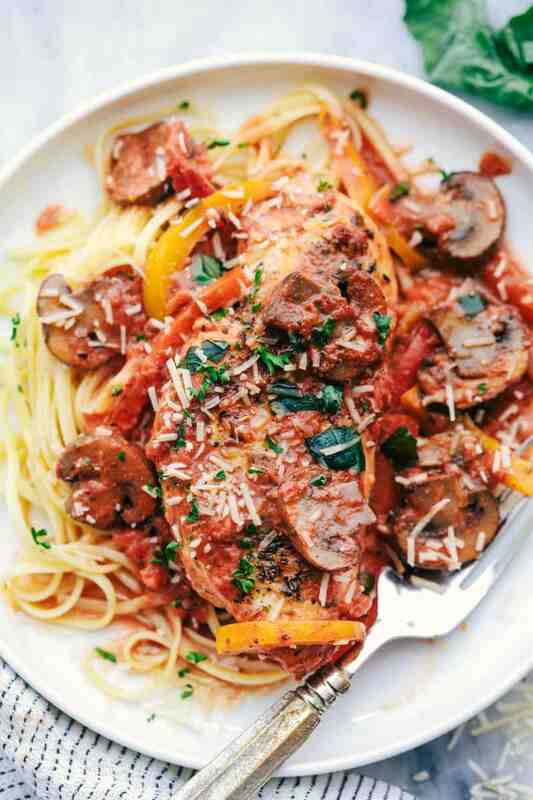 Can You Make Chicken Cacciatore in a Slow Cooker? Yes! This is a great slow cooker meal! Lightly brown the chicken in a skillet. Add the chicken to the slow cooker. Add the Italian Seasoning on top of the chicken. Continue to sauté the following ingredients for the sauce. Once cooked, you will add the sauce to the slow cooker on top of the chicken. Cook on low 4 to 6 hours until the chicken has reached 165 degrees Fahrenheit. Can You Make Chicken Cacciatore Ahead of Time? Yes! This is a great recipe that can be made ahead of time. It reheats well too! What is the Best Way to Reheat Chicken Cacciatore? Microwave: Place leftovers in a microwave safe container. Heating 1 minute at a time. Oven: Preheat oven to 350 degrees Fahrenheit. 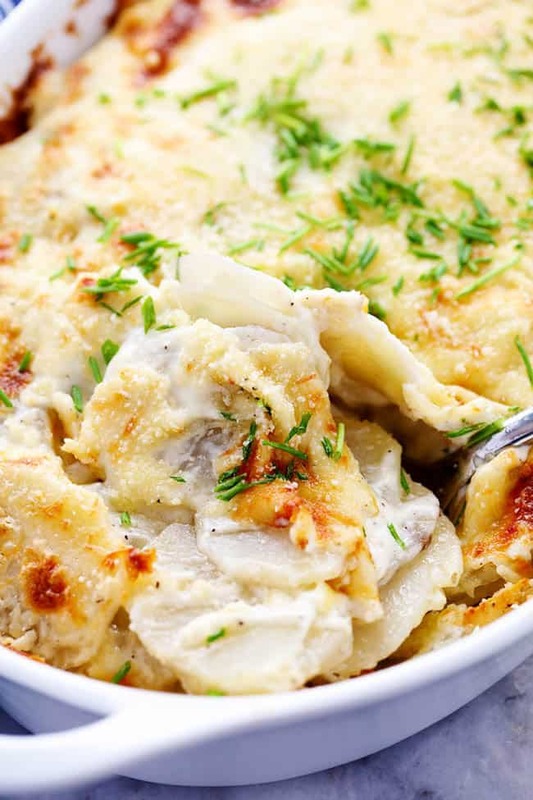 Place leftovers in an oven safe baking dish. Cover with foil and bake 15 to 20 minutes until warm. Stove top: Place leftovers in a cooking pan and cover with lid. Cook over medium heat until warm. Stirring occasionally. Does Chicken Cacciatore Freeze Well? Yes! Although, I recommend making this dish fresh and reheating within the week for best results. This does make a great freezer meal too. Using an airtight container to store it or a freezer safe bag works best when freezing. When ready to reheat the Chicken Cacciatore, thaw the freezer package, then chose a reheating method from above. What Goes Well With Creamy Skillet Chicken Cacciatore? Semolina pasta, gnocchi, rice or egg noodles are great! Large cut, lightly seasoned roasted potatoes to decorate the dish look professional. A side of spinach or broccoli quickly sautéed in a bit of olive oil, butter and garlic can add some variety too! Not only is this red sauce perfectly creamy, it has tender peppers, fresh basil, mushrooms and the perfect blend of spices. 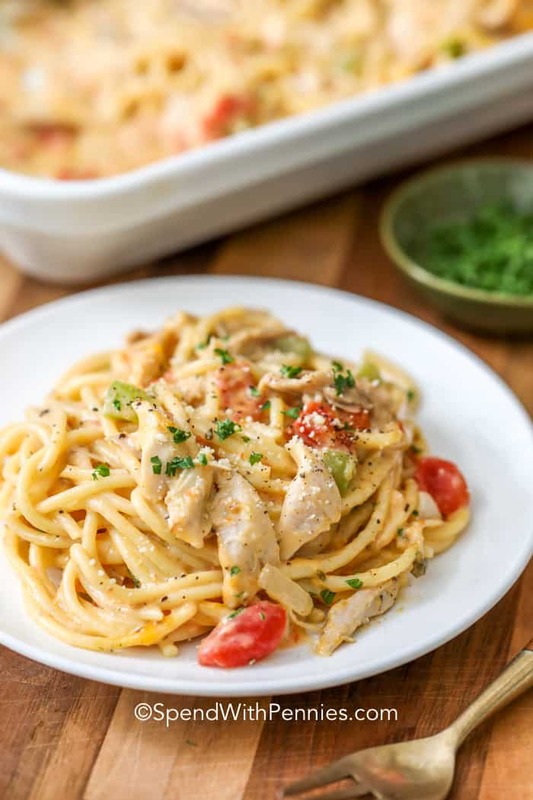 Add some tender and juicy pan fried chicken and serve it over some pasta and you have the perfect meal. 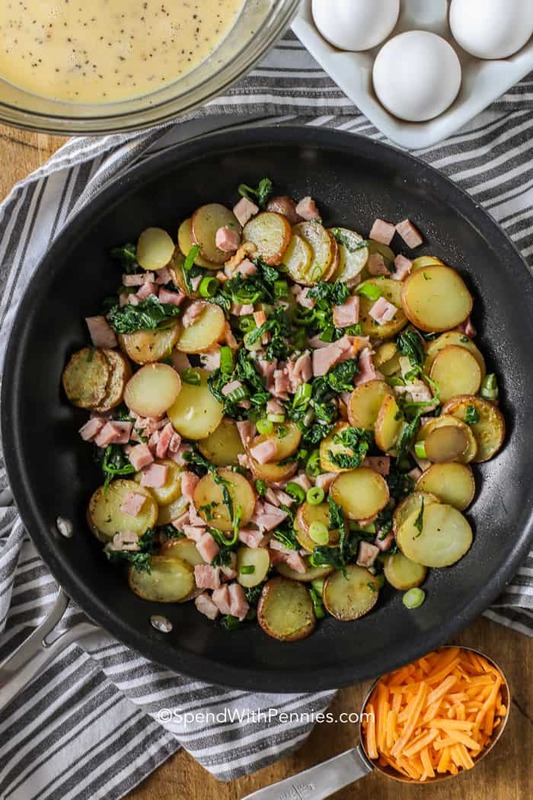 You guys are going to love this quick and easy skillet meal! Looking For More Chicken Recipes? Here Are Some! Season the chicken with Italian seasoning and salt and pepper. In a large skillet add 1 tablespoon olive oil and heat to medium high. Cook the chicken about 3 minutes on each side or until a thermometer reads 165 degrees and brown on each side. Set aside the chicken on the plate. Add one tablespoon olive oil to the skillet and add the garlic, bell pepper, and mushrooms. Sauté until tender. Add the crushed tomatoes, heavy cream, chicken broth, italian seasoning, and salt and pepper to taste. Let simmer until thickened. Add the chicken back to the skillet until heated through. Serve over hot pasta and garnish with fresh chopped basil and parmesan cheese if desired. 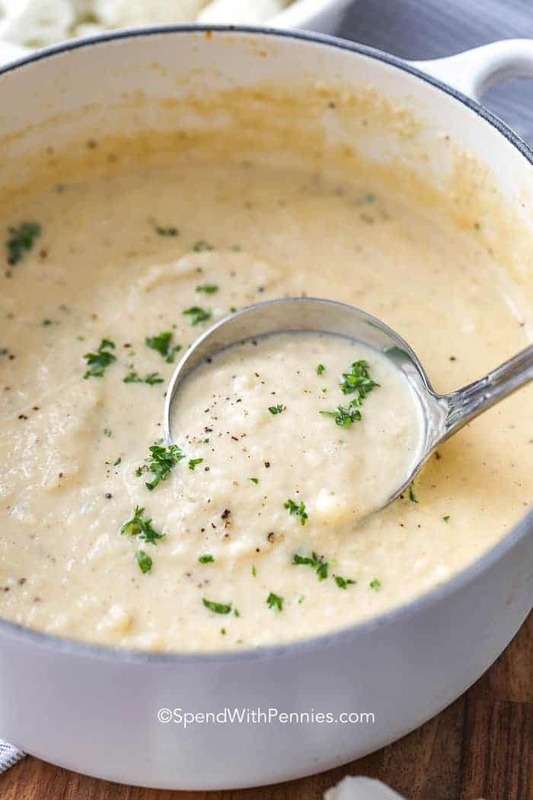 Cream of Cauliflower Soup is a simple 30 minute soup perfect for lunch or a light dinner meal. We serve this creamy soup when company’s coming or just for a Saturday afternoon. Add in a side of crusty bread for dipping or some 30 Minute Dinner Rolls and a fresh crisp Italian Salad. Cauliflower is the perfect veggie, it’s versatile and mild in flavor making it perfect for Cauliflower Mashed Potatoes or even for creating a low-carb cauliflower fried rice. It makes a great base for this mild soup recipe and is perfect paired with cream and cheeses if you’d like! 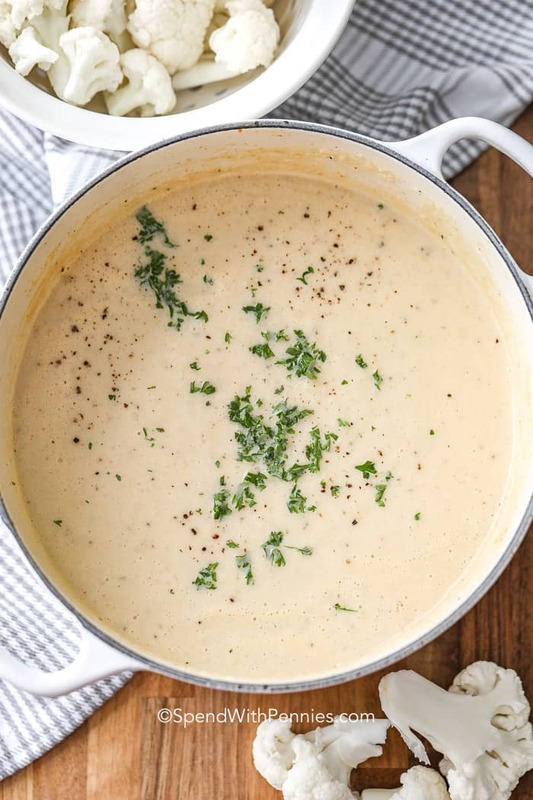 This recipe is relatively healthy and the lack of flour or starches keeps this cream of cauliflower soup keto friendly and low carb! There really isn’t a lot to creating the perfect cream of cauliflower soup recipe. Simply chop the cauliflower into bite sized pieces, add seasonings and let it simmer until tender. Blend and add a bit of cream. I sometimes add cheese to this soup, both sharp cheddar and parmesan cheese work well. Remember to add the cheese at the end, once the soup is ready to serve. Cooking cheese over a high temperature can cause it to separate or become grainy. It will melt in if the soup is hot once you remove the soup from the stove. 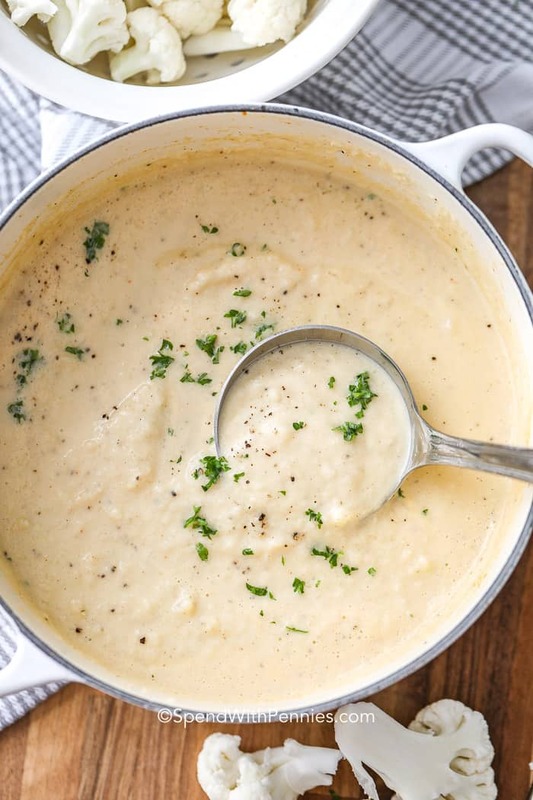 Just like Roasted Cauliflower Soup, this cream of cauliflower soup is blended to a smooth consistency. I use a hand blender to make it smooth (and save on washing dishes) but you can also transfer it to a regular blender. If using a regular blender, be sure that the lid isn’t on tight as the steam and cause the blender to burst open. For more texture remove some of the cauliflower and chop it. Blend the soup to desired consistency and once blended, add the chopped cauliflower back into the soup. This soup does freeze well. We place it in single serve freezer bags and label. To serve, defrost in the refrigerator overnight and reheat in a saucepan over medium heat until warm. Crock Pot Broccoli Cheese Soup – Easy favorite! Creamy Sausage & Cabbage Soup – Five star recipe – the ultimate comfort food! 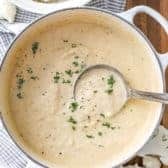 Potato Leek Soup – Classic creamy soup combo. Creamy Carrot Soup Recipe – Inexpensive and easy, kids love this recipe! 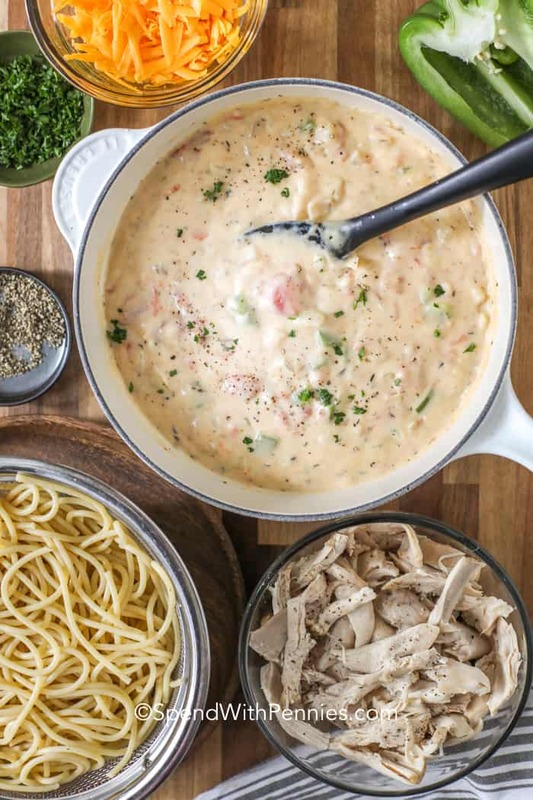 Creamy Seafood Chowder – Loaded with seafood! Baked Potato Soup – The best baked potato flavors! A silky smooth cauliflower soup for the perfect lunch or starter. Heat butter in a medium saucepan over medium heat. Cook onion and celery until tender (do not brown). Add cauliflower, broth and seasonings. Simmer uncovered 10-15 minutes stirring occasionally until cauliflower is tender. Blend using a hand blender until smooth. Add heavy cream and simmer an additional 8-10 minutes or until thickened. Season with salt & pepper to taste. Stir in parmesan cheese if using. Note: For a chunky texture, remove 1 cup of cauliflower before blending and coarsely chop. 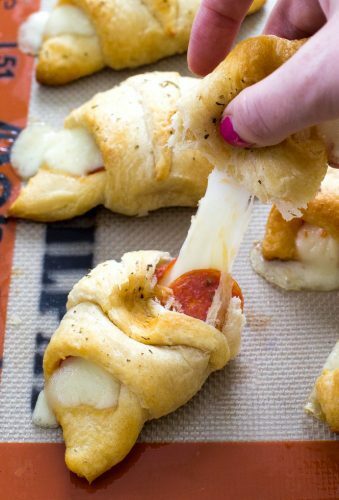 Pizza Stuffed Crescent Rolls are loaded with gooey mozzarella cheese and pepperoni. Serve with warm marinara for dipping! Snack time just got upgraded with these rolls. Totally kid approved! 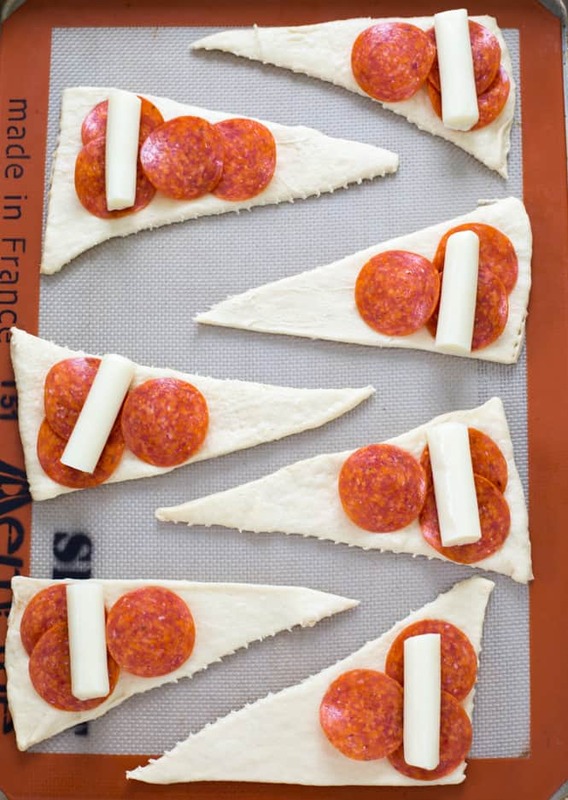 If you love quick and easy snacks for your kiddos try this Pizza on a Stick, Crispy Baked Parmesan Ravioli or Pepperoni Pizza Dip. Today I am sharing these AMAZING Pizza Stuffed Crescent Rolls! These are so simple to make and they don’t last long once they are out of the oven. The warm mozzarella melts in your mouth with a hint of spice from the pepperoni. An easy and quick way to make a pizza with the light and flakey crescent roll. The handheld pizza is sure to please any kiddo that is on the go or just enjoying an after school snack. I love making these for my kids if they need a weekend snack or even if it is game night. My daughter loves to help in the kitchen and these are the perfect snack for her to make along side of me. Her cute little hands melt my heart as she is a preparing them on the cookie sheet for the oven. She loves to watch the crescent rolls bloom in the oven as they are baking. These are great for any age! My boys love to come home from school and pop open a tube of crescent rolls and make these while unwinding from their long day. I often catch myself listening in to their conversation while they are in the kitchen together waiting for them to bake. Lots of laughter and talking but once that oven beeps it is silent from them eating these right out of the oven. haha. 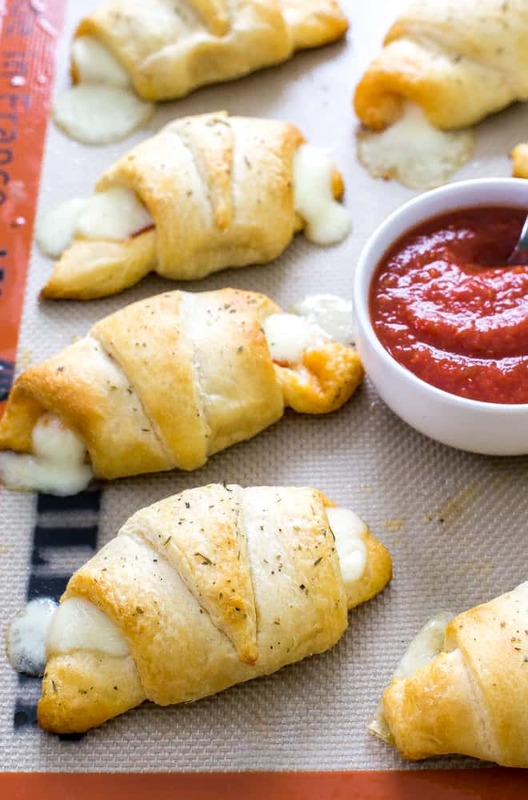 These Pizza Stuffed Crescent Rolls are so easy to make and are seriously addicting. Warm, flakey crescent rolls filled with gooey mozzarella cheese and pepperoni! How Do You Make Pizza Stuffed Crescent Rolls? 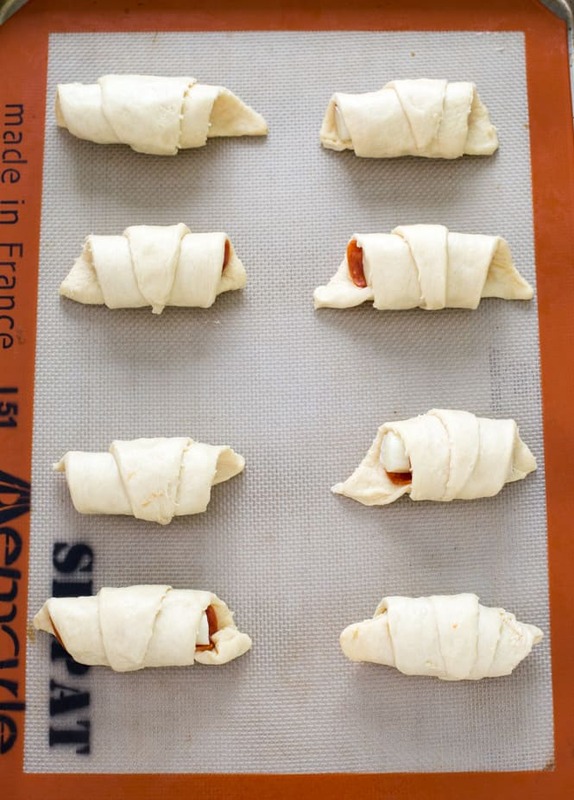 Unroll crescent rolls onto a baking sheet lined with a silicon baking mat. Separate into triangles. Place pepperoni on the widest side of the triangle. Place a 1/2 of a mozzarella stick on top. Roll the wide end to the smaller tip of the crescent making sure to tuck in the corners so the cheese doesn’t ooze out. Brush melted butter onto crescent rolls. Sprinkle with Italian seasoning and garlic powder if desired. Can You Use Other Types of Cheese? Yes! I would recommend using mozzarella cheese sticks for best results and the perfect amount of cheese but I totally understand experimenting with other cheeses. Cheddar cheese or grated cheese also works for this snack. What Other Toppings Can Go In The Crescent Rolls? Looking For More Pizza Inspired Meals?! Here they are! Pizza Stuffed Crescent Rolls loaded with gooey mozzarella cheese and pepperoni. Serve with warm marinara for dipping! Crock Pot Broccoli Cheese Soup is a bowl full of comfort! Thick, cheesy, and addictive, this delicious soup simmers all day in the crock-pot and is ready to eat when you are, with just a few finishing touches. This rich velvety soup is loaded with broccoli and lots of cheese for the perfect slow cooker soup recipe! It’s creamy, dreamy, delicious! 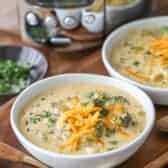 While I do love a good quick Broccoli Cheese Soup, making Crock Pot Broccoli Cheese Soup can be a real lifesaver on those busy family days when everyone is coming and going! 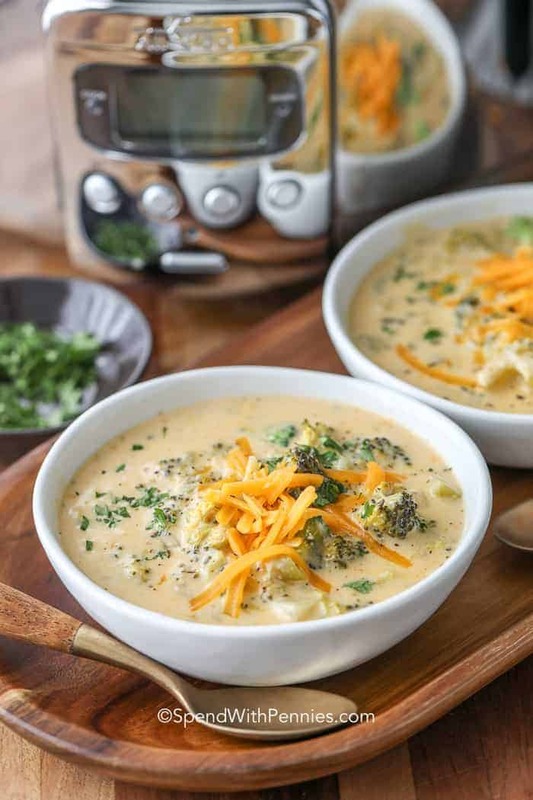 The crockpot is the real hero in this broccoli and cheese soup recipe because you just set it and forget it! In fact, why not put it together before work and come home to a healthy, filling dinner that everyone will love! Better yet, only one pot to wash! BROCCOLI: Be sure to properly prep the broccoli by removing the fibrous outer skin and chop into uniform pieces. Place in the crock pot and onions and chicken stock. Make sure there is enough stock to completely cover the broccoli because this will be the base. COOK: Cover the crockpot and cook (on low or high) until the broccoli is tender. Add evaporated milk 30-60 minutes before serving. BLEND: You can leave it chunky or puree it with a hand blender until it is smooth. Personally, I like to take some of the broccoli out and chop it, puree the remainder using a hand blender and then add the chopped broccoli back in! CHEESE: Add the cheese just before serving. Dairy (including cheese) can break down and separate if cooked too long or too hot (the exception to this rule is Velveeta, it can be added a bit sooner to melt). ADD-INS: This soup is versatile. We sometimes add in some chunks of processed cheese (Velveeta), a half the jar of Alfredo sauce or a few spoonfuls of pesto. Top it with bacon, add in some garlic or serve it with croutons! Add some diced potatoes for a heartier broccoli potato cheese soup. Or leave the recipe as is and enjoy it as a low carb broccoli cheese soup! 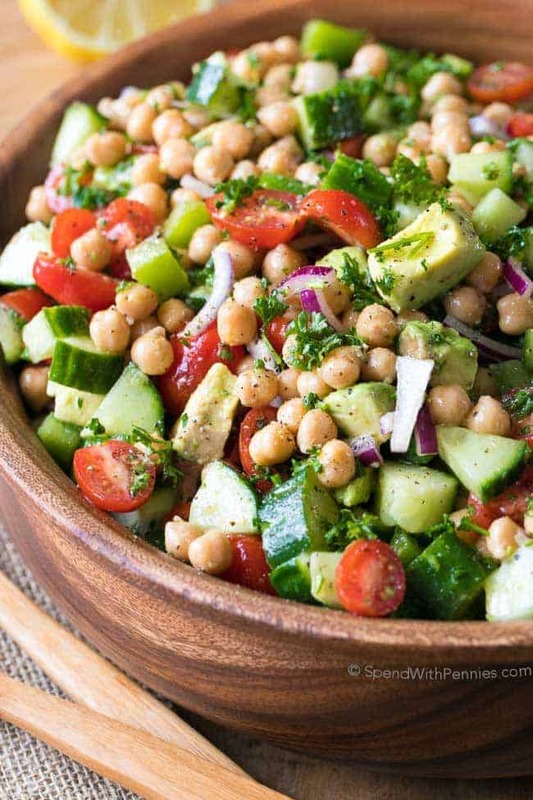 Great for a potluck! When pureeing the soup, remember not to put hot soup in a blender with a lid! I used an immersion blender (hand blender) in the slow cooker. The addition of alfredo (I used light) makes this soup extra rich and creamy! What to Serve with Broccoli Cheese Soup? Broccoli and cheese soup is rich, so pair it with simple sides like a crisp salad or coleslaw, some fresh fruit, or some crusty bread and croutons. Let the soup be the star of the show! Better with Bread: This soup is terrific when served in homemade bread bowls, or with homemade buttermilk biscuits or dinner rolls on the side. It’s even better the next day! You can freeze Broccoli Cheese Soup! Ladle portions into Ziploc bags, label, and lay flat so when they freeze, they will stack easily and save space! This soup is low carb so it’s a great recipe to add into your regular rotation! It’s tough to find a good broccoli cheese soup without Velveeta so don’t forget to bookmark or pin this recipe to save it! Thick, cheesy, and addictive, this delicious soup simmers all day in the crock-pot and is ready to eat when you are, with just a few finishing touches. Heat butter in a small pan over medium heat. Cook onion and celery until tender, about 3 minutes. 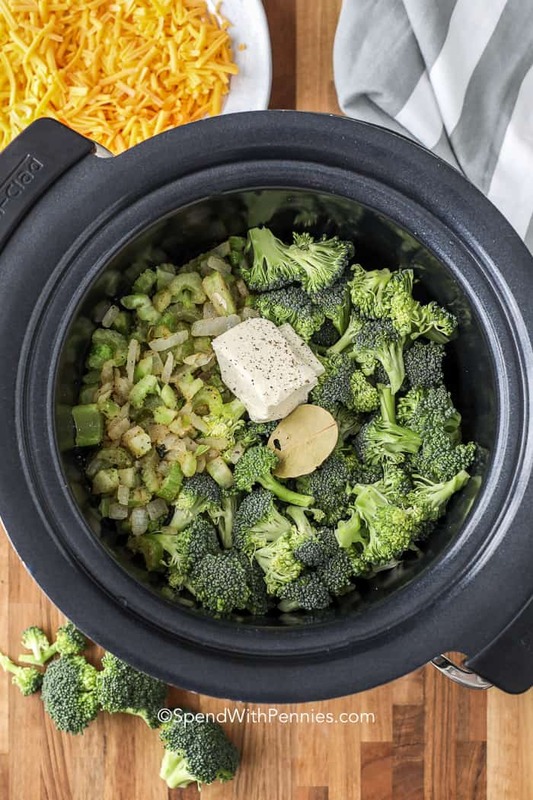 Wash and chop the broccoli and place in the slow cooker. Add cooked onion, garlic powder, bay leaf, chicken broth, cream cheese and salt & pepper to taste. Cook on low 6-7 hours (or high 3-4 hours) or until broccoli is tender. Add evaporated milk and cook 30-60 minutes more. Discard bay leaf. Remove one cup of broccoli and coarsely chop. Puree remaining soup using a hand blender. (You can puree a bit to break up the broccoli or until completely smooth depending on preference). Add chopped broccoli back into the soup. Stir in all of the cheeses until melted. Garnish with additional shredded cheeses, or 1/2 tsp of pesto sauce. For a thicker soup, create a cornstarch slurry by combining 2 tablespoons water with 2 tablespoons cornstarch. Add a little at a time to reach desired consistency. Allow to cook an additional 10 minutes.